Big Woofs Up for New Mutts Treasury! Viewers of Nature’s Why We Love Cats and Dogs should remember the scene where Jim and René mention a comic strip taped to the back of their medicine cabinet door. 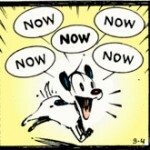 It shows Ozzie wondering what time it is, and Earl the dog answering with a resounding Now! Now! Now! Now! Now! Being huge Mutts fans, they were excited to hear about the new Mutts Treasury from Patrick McDonnell featuring all our favorite furry friends from the funnies. Hoping it might include this strip, they requested a review copy from Andrews McMeel publishing who kindly obliged. And guess what? Check out page 40! McDonnell has an uncanny ability to say it all, in just so many words. An important task for an artistic novelist whose pages are but frames and panels told over time. A task which Patrick executes exquisitely, and consistently. 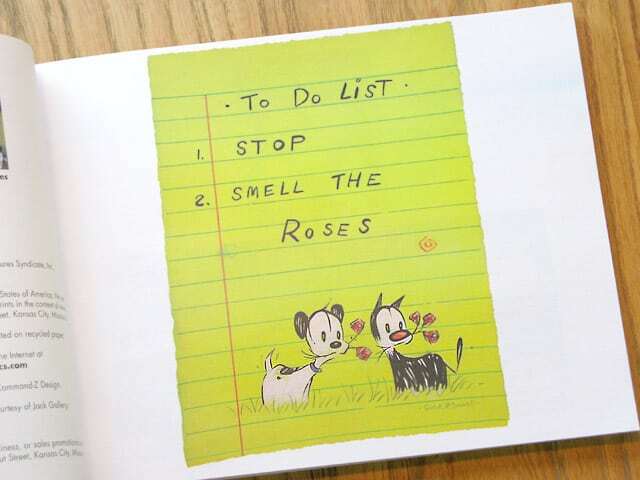 His new Mutts Treasury, Stop and Smell the Roses is a perfect example. This beautiful keepsake book chronicles a year in the life of Earl and Mooch, our favorite dog – cat duo from the funny pages. And it does so with thought provoking themes throughout the seasons, along with a selection of gallery-worthy title panels. We have always thought Mutts was a cute feature good for a quick giggle, or warm fuzzy feeling – like another favorite, Pearls Before Swine. But reading this compilation through made us quickly realize it is so much more. McDonnell offers profound simplicity through the minds of Earl and Mooch. This struck us first with his periodic selections of quotes and proverbs, including one that Jerry himself could have coined: “It’s a beautiful day for it.” – A Wilbur Cross quote over a single panel with Earl greeting the day with gusto. He also offers his own short and sweet gems of wisdom, like when Earl and Mooch watch a butterfly flit all about only to say, “I’ve never seen a butterfly in a hurry.” Or some that require no words at all. Like how he captures the amazing intention of dogs simply by showing Earl’s eye on the baseball pitcher, or a blank frame where Earl beats the reader to the punchline. It was a pleasure to catch up with the Mutts gang after missing out on our daily fix for the two years we’ve been on the road. And of course we were happy to see this collection includes the strip that means so much to us, where Earl proves that dogs always know what time it is: Now. It also hit home to see Earl and Mooch hit the road in a “Kitty Car”. Seeing them enjoy a road trip like we did with Jerry strengthens the connection we feel with Patrick McDonnell’s work. As do his Shelter Stories about the special needs pets, like the deaf dog or one-eyed cat. There are two things at which McDonnell excels with his work in Mutts. He addresses important topics – like saving the tigers – without being preachy. And he’ll make you laugh when you least expect it. So if you’re a Mutts fan, or just want a copy of that now famous strip we spoke of on PBS, check out Stop and Smell the Roses – A Mutts Treasury. And if this is the first you’ve heard of Mutts, now is your chance to see what treasures you’ve been missing.